Are you the life of the party? Always ready for a good time? Always getting into trouble for the fun you have. People enjoy the fun and games you come up with, but sometimes you do make quite a big mess. You fall when you are on a ball, holding books, and a fish on a rake. You come tumbling down disturbing the room. You aren't the only one who has this problem. It is fun to have fun, but you have to know how. The Cat in the Hat sure knows how to have fun, just like you. He can throw the fish around and catch him in a pot. He has friends, Thing One, and Thing Two, to play with. But he also knows how to clean up his messes, like you. You both know how to pick up the books, and put the fish back in his bowl, and put the rake back in the shed. All before someone finds out. 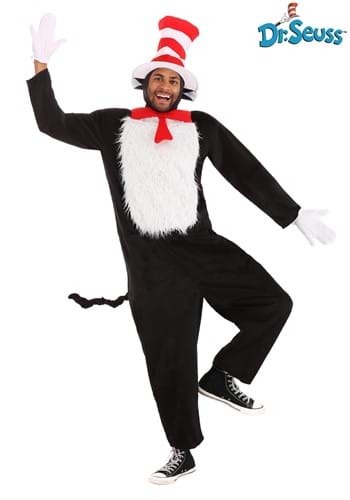 At your next party, pull out this Deluxe Adult Cat in the Hat Costume. Nobody will be surprised that you are the life of the party. Nobody will be surprised when you invite Thing One, or Thing Two over. No one will be surprised that you can stand on a ball balancing books, and a fish on a rake. You will be the only one who is surprised when you fall. And nobody will be surprised when you clean up the mess you made, because that is what cats in hats do. Clean up the messes they make. Because you know how to have fun.